A settlement of the Kent State civil suit has been reached out of court in an agreement mediated by Federal Judge William Thomas, and for this we are grateful. The settlement provides for the payment of $675,000 in damages by the State of Ohio and for a signed statement of regret and intentions by Governor James A. Rhodes, Generals Del Corso and Canterbury, and officers and men of the Ohio National Guard. We, as families of the victims of the shootings by the Ohio National Guard at Kent State University, May 4, 1970, wish to interpret what we believe to be the significance of this settlement. To obtain sufficient financial support for Mr. Dean Kahler, one of the victims of the shooting, that he may have a modicum of security as he spends the rese of his life in a wheelchair. The State of Ohio although protected by the doctrine of sovereign immunity and consequently not legally responsible in a technical sense, has now recognized its responsibility by paying a substantial amount of money in damages for the injuries and deaths caused by the shooting. State officials, national guard command officers, and guardsmen have signed a statement submitted to the families of the victims of the shooting which not only expresses request and sorrow — eight years belatedly — but also recognizes that another method than the use of loaded combat rifles could have resolved the confrontation at Kent State University. The statement also asserts that better ways must be found for future confrontations which may take place. 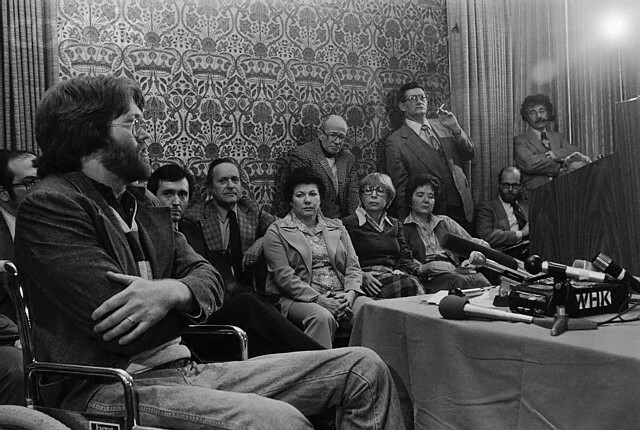 The Scranton Commission which investigated campus disorders in the Summer of 1970 said that the Kent State Shooting was, “unnecessary, unwarranted, and inexcusable.” The signed statement of the officials and the guardsmen at least now agrees that the shooting and killing was unnecessary, and now at least, the State of Ohio has assumed responsibility for the act. We recognize that many others related to the May 4th event have also suffered during the past eight years – including Kent State University students, faculty and administrators, as well as Ohio National Guardsmen and their families. Indeed, we believe that some of the guardsmen on Blanket Hill on that fateful day also became victims of an Ohio National Guard policy which sent them into a potential citizen confrontation with loaded combat rifles. We did not want those individual guardsmen to be personally liable for the actions of others and the policy of a governmental agency under whose orders they served. Yet the doctrine of sovereign immunity which protects the State of Ohio from being sued without its permission, made it necessary for us to take individuals to court. Only then did the State respond — furnishing more than two million dollars for the legal costs of the defense of officials and guardsmen and finally being willing to pay costs and damages of the victims of the shooting. We want to thank those that sustained us in our long struggle for an expression of justice. More than 40,000 individuals made contributions of money for our legal costs, students and faculty members on many campuses, but particularly at Kent State University have furnished us effective support. The American Civil Liberties and its volunteer attorneys — as well as many other lawyers — have skillfully and devotedly served us throughout these years. The Board of Church and Society of the United Methodist Church has faithfully supported and coordinated our struggle from the beginning. We are grateful to all of them. Because of the experience that we have had during the past eight and one-half years, there are other words, which we are compelled to speak. We have become convinced that the issue of the excessive use of force — or the use of deadly force — by law enforcement agencies or by those acting with the authority of law enforcement agencies, is a critical national issue to which the attention of the American people must be drawn. President Carter, on December 6, 1978, in his speech on the Thirtieth Anniversary of the Universal Declaration of Human Rights, said, “Of all human rights, the most basic is to be free of arbitrary violence . . .” He then noted that citizens should have the right to be free of violence which comes from governments. We deplore violence in every form for any cause and from every source. Yet we believe the average American is little aware of the official violence which has been used across our land indiscriminately and unjustifiably. Twenty-eight students have been killed on campuses in the past ten years. A long but unnumbered list of residents in minority communities have been killed by police unnecessarily. We find it significant that just a few weeks ago the United States Commission on Civil Rights held a consultation in Washington, D.C. on, “Police Practices and the Preservation of Civil Rights” in preparation for the conducting of hearings on the use of deadly force in selected cities. That is the issue with which we have had to be concerned. I tis an issue with which a growing number of citizens are becoming concerned. Through our long legal and political struggle we have become convinced that the present federal law which protects citizens from the deprivation of their civil rights by law enforcement agencies or those acting with their authority, is weak and inadequate. It is a provision which is little used — but when it is used, it has little use. A citizen may be killed by those acting under the color of Law almost with impunity. The families of the victim of those shootings or killings have little recourse and then only through an expensive and lengthy process. We believe that citizens and law enforcement must, in the words of the signed statement of the settlement, find better ways. We appeal for those better ways to be used not only on campuses but in cities and communities across the land. We plead for a federal law which will compel the consideration and use of those better ways. We are simply average citizens who have attempted to be loyal to our country and constructive and responsible in our actions, but we have not had an average experience. We have learned through a tragic event that loyalty to our nation and it’s principles sometimes requires resistence to our government and its policies — a lesson many young people, including the children of some of us, had learned earlier. That has been our struggle — for others this struggle goes on. We will try to support them.